Moving Out of Poverty: Rising from the Ashes of Conflict, is the fourth volume from the Moving Out of Poverty series launched in 2007 is under the editorial direction of Deepa Narayan, Senior Advisor of the World Bank and former director of the pathbreaking Voices of the Poor series. It features the results of new comparative research across more than 500 communities in 15 countries to understand how and why people move out of poverty, and presents other work which builds on interdisciplinary and contextually grounded understandings of growth and poverty reduction. DEEPA NARAYAN is project director of a 15-country World Bank study, Moving Out of Poverty: Understanding Freedom, Democracy, and Growth from the Bottom Up, which builds on an earlier study also directed by Narayan, Voices of the Poor. Formerly a senior adviser in the Poverty Reduction group of the World Bank, Narayan has over 25 years of development experience in Asia and Africa, working for nongovernmental organizations, national governments, and the United Nations system as well as the World Bank Group. Her areas of expertise include participatory development, community-driven development, and social capital, and the use of these concepts to create wealth for the poor. 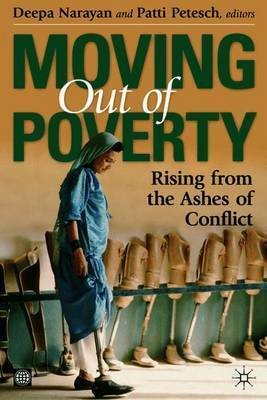 Recent publications include Moving Out of Poverty: Cross-Disciplinary Perspectives on Mobility (World Bank, 2007); Ending Poverty in South Asia: Ideas that Work, co-edited with Elena Glinskaya (World Bank, 2007); and Measuring Empowerment:Cross-Disciplinary Perspectives (World Bank, 2005). PATTI PETESCH is a specialist in qualitative analysis on the causes of poverty, how people escape poverty, and the role of individual and collective agency in these processes. She freelances for the World Bank and other international development organizations, and served as coordinator for the World Bank's global Voices of the Poor and Moving out of Poverty studies. Her recent publications include Moving Out of Poverty: Cross-Disciplinary Perspectives on Mobility, (edited with D. Narayan); Evaluating Empowerment: A Framework with Cases from Latin America, (with C. Smulovitz and M. Walton); and Voices of the Poor from Colombia: Strengthening Livelihoods, Families and Communities, (with J.Arboleda and J. Blackburn).